New Delhi: India’s foreign direct investment (FDI) outflows more than doubled in 2017 to $11.3 billion while FDI inflows fell 9% to $40 billion during the year, according to the latest World Investment Report, 2018, released by the United Nations Conference on Trade and Investment (UNCTAD). 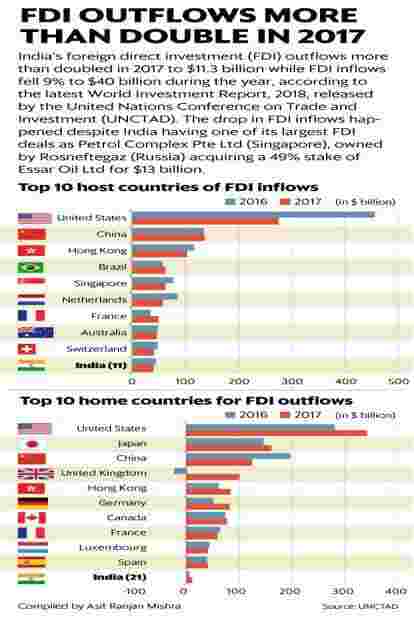 The drop in FDI inflows happened despite India having one of its largest FDI deals as Petrol Complex Pte Ltd (Singapore), owned by Rosneftegaz (Russian Federation) acquiring a 49% stake of Essar Oil Ltd, the second largest privately owned Indian oil company, for $13 billion. An investor group including eBay Inc. (US), Microsoft Corp. (US) and Tencent Holdings (China) acquired a stake in Flipkart Internet for $1.4 billion. SoftBank Group Corp. (Japan) acquired a 20% stake in One97 Communications Ltd, which runs Paytm, for $1.4 billion. Among overseas foreign investments made by Indian companies, state-owned oil and gas company Oil and Natural Gas Corp. Ltd (ONGC) bought a 15% stake in an offshore field in Namibia from Tullow Oil (founded in Ireland and headquartered in the United Kingdom) in 2017. By the end of 2017, ONGC had 39 projects in 18 countries, producing 285,000 barrels of oil and oil-equivalent gas per day.